This is a repost from my Women’s Post column, published every Thursday at Women’s Post online, but a friend was looking for this particular piece and since I wrote it over a year ago it’s really hard to find so enjoy a little crazy on this warm Thursday afternoon. Dating is hard, especially around Valentine’s Day when single sounds like a dirty word and every date comes with the added pressure of the Hallmark holiday. Recently while having dinner with a group of friends I received a call from one of my best girlfriends who needed to see me for drinks immediately, assuming that something was wrong I invited her to join us. After she ordered a very large glass of wine and a piece of cheesecake we had the pleasure of hearing about what was possibly the worst blind date… ever. Blind dates are never a good idea but when a friend sets you up with someone you go in confidently knowing that a friend would never put you in an uncomfortable situation; for whatever reason this was not the case on that particular evening. My friend arrived at the date with high expectations, hoping for at the very least a fun evening what she was met with was a clipboard and a Dating Contract; she was instructed by Mr. Clueless to read and sign the 2 page, 6 clause document before the date could begin. Knowing that this date had gotten off to a bad start anyway, the lifelong Torontonian had met Mr. Clueless at a restaurant in The Rogers Centre for dinner even without the Dating Contract he had lost points for choosing the most touristy possible location. 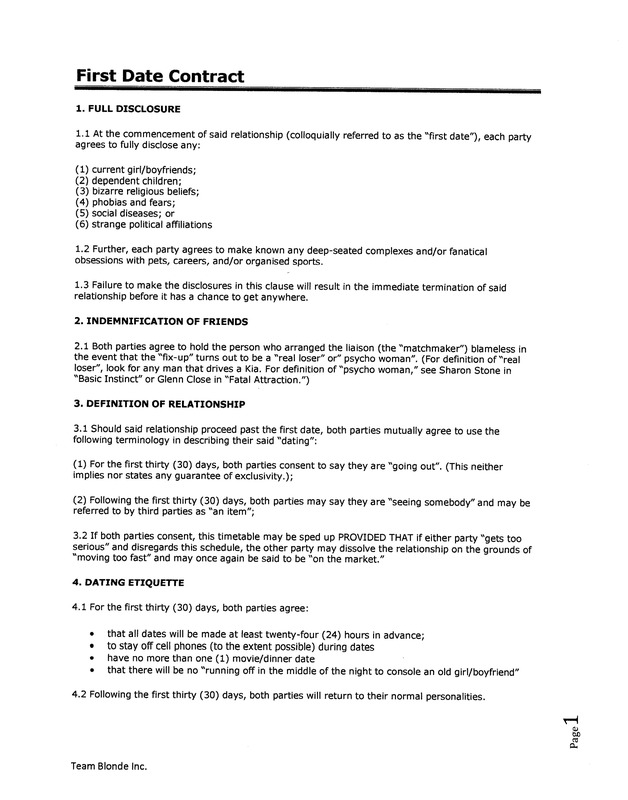 The best thing about the Dating Contract is that my friend had to agree to indemnify the woman who had set them up, which I imagine is good for their friendship. As I read through the contract to our friends at dinner it was met with a mix of shock and disbelief; how could a man living in Toronto actually be this clueless? How could anyone that has ever been on a date try this on someone? Did we accidentally stumble into some real life sitcom? Friends hasn’t been on the air for years but I’m pretty sure this would have made an excellent plot line. To her credit my friend managed to stay with Mr. Clueless all the way through dinner and she even went with him to the top of the CN Tower which again for a lifelong Torontonian is cheesy and forced but when he tried to get her to stand on the glass floor despite her fear of heights, she called it a night. To his credit I’d like to thank Mr. Clueless for providing me and several friends with an evening of laughter; but if I could give you one piece of advice Mr. Clueless it would be this, don’t try so damn hard. Deciding how you’re going to introduce someone to your friends over the course of the next 3 months is just a bit much, especially when it comes before drinks.